The 100" Power Package is the ideal combination of performance and savings to transform your Twin Cam HD without breaking the bank. 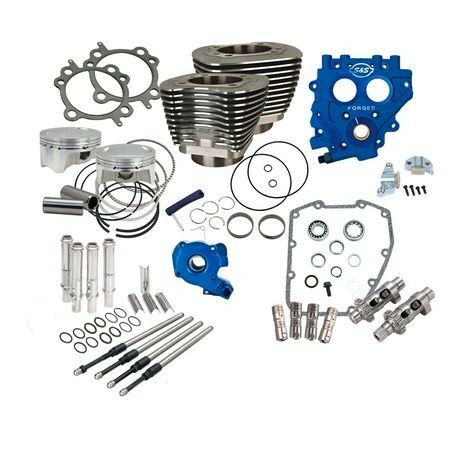 Bump the early Twin Cam from 88ci to 100ci as well as adding matched cams/cam plate/oil pump and everything else a high performance cam chest needs to reliably make big power. S&S, solid company, great build quality and performance. This package took 5 weeks to arrive but was worth the wait. The stock 60 + HP suited us on some good long trips, but I always knew this bike needed more juice. Now, with 90+ HP it has the torque it was meant to from the factory. Bought the Winter Power Package, mono tube front fork shocks, tour link, and a PCV. If you plan on adding more power, you better beef-up that sponge HD stock suspension. The 585 cams with 10.5.1 compression have more power through the entire RPM range. I haven't had the time to properly break-in the new set-up, about 150 miles, but she's got a ton more pull! TON!! Can't wait for a few more miles so I can open her up all the way. High-Flo air kit, 2 into 1, PCV5, lots of goodies, and all the S&S bits, nice. 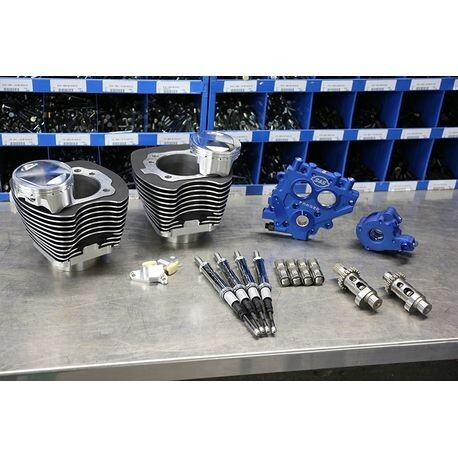 Notice: S&S TC3 oil pumps and cam support plates for 1999-’16 Harley-Davidson® big twin engines are machined from aluminum forgings. This provides the strength and dimensional stability of a billet part, and eliminates voids, inclusions, and other structural defects associated with castings. Due to the material used and the as-forged texture of the parts, there may be some variation in the color of the blue anodized finish. This does not constitute a defect. Despite variations in color, the ability of the anodized coating to protect the parts is unchanged. You may install these products with confidence, knowing that they will function as they are intended.